The Practical Guide for Specialised Entities is a comprehensive workbook. 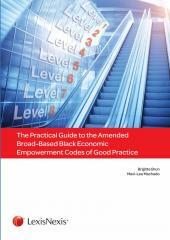 The Practical Guide for Specialised Entities is a comprehensive workbook which will assist all Public Entities, Government Departments, Universities and Non-Profit Organisations with the development of their transformation strategies in line with Broad-Based Black Economic Empowerment rules and regulations. The book helps the lay-person to understand the complexity of B-BBEE as well as take them through practical calculation examples on how to calculate their B-BBEE Score. This title is an easy to read, practical workbook on B-BBEE for specialised entities. Linked to a Scorecard Calculator Tool which automatically provides up to date status of the organisation's B-BBEE Score. This title also contains all relevant legislation under one cover for a comprehensive understanding of B-BBEE.